When you think of Sun Cellular, you associate it with words such as unlimited and value for money. Sun Cellular aims to bring these words in the world of wireless broadband through the Sun Broadband Wireless. Go online anytime you like in the Metro and North Luzon using the fastest HSDPA technology with speeds up to 3mbps. 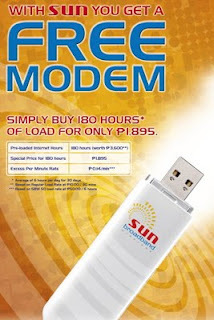 Sun broadband wireless offers the lowest unlimited plans for only P799 and P649 for existing Sun postpaid users. The prepaid kit is only P1,895 and it comes with a free 180 hours of surfing. You can get a Sun Broadband Wireless kit from me and get a discount. You can contact me through my mobile number at +63.908.7568699 or email: arvinello@gmail.com.